A sliver of moon on the western horizon. The next lunar cycle is underway. The vernal equinox was a couple of weeks ago but today, April 6, was the REAL first day of spring this year. A glorious Saturday, the sun burned through some light morning fog around 9 o’clock and shone the remainder of the day. 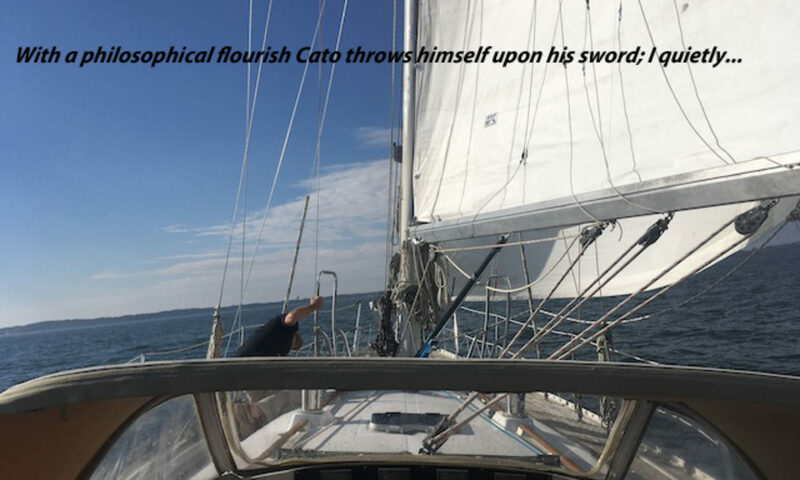 A light breeze caressed the waters of Chesapeake Bay and anyone who wasn’t working to bring their boat out of its winter slumber was out on the bay enjoying themselves. Mmm…pasta, salad and a Pounder Pils beer for dinner in the cockpit of Further. Now THAT’S livin’! I finally took off around 5 p.m. and moseyed back home to Further. 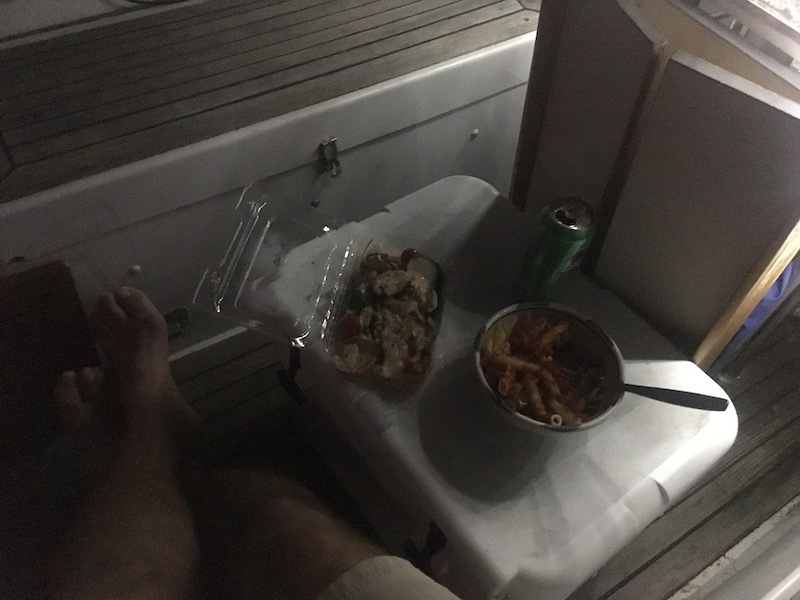 And in the midst of cooking up a pasta dinner and doing a few odds and ends around the boat, I took in a superb evening. And while enjoying the first dinner in the cockpit of the season — while listening to my beloved Grateful Dead, of course — I glimpsed in the west a super-young moon. Just a sliver visible above the trees and buildings on shore, but there it was. The photo isn’t so great — my eyes are such that I can’t really tell when I have the damned camera focused sharply or not — but you get the idea. 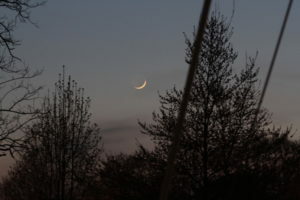 I should have known it was coming after seeing a really old moon — an equal but opposite-side sliver — early in the morning on Tuesday en route to play hockey. That sliver was just coming up with the sunrise while this one was just going down with the sunset. 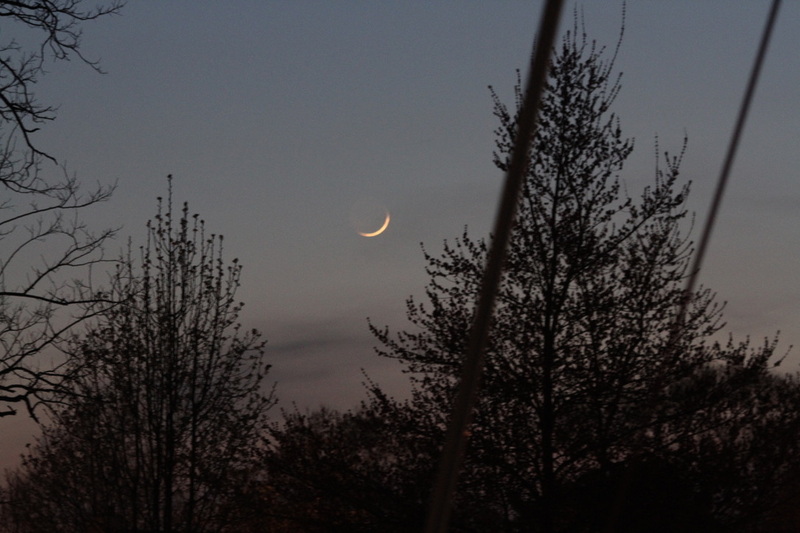 The new moon was around Thursday or so. Point is: a view of a sliver of moon while listening to the sound of bird song capped off a glorious day and a sublime evening. Spring has well and truly sprung now, thank goodness.